Description and Definition of Arrowheads: Arrowheads or Arrowpoints are the pointed head or striking tip of an arrow. An arrowhead point or tip made of stone, bone or horn which in general is less than 1 inches (25 mm) in length and weighs under 15 grams. Arrowheads are regarded as Native American artefacts and are attributed no earlier than the Woodland phase of North American prehistory that is now generally viewed as a cultural developmental stage dating from about 3,200 to 1,000 years ago. Metal arrowheads were used following the introduction of different metals by the Europeans in the 1500 and 1600's. Arrows were the missiles shot from bows which were made from a straight thin shaft and usually feathered and barbed. An arrowhead was the blade or point that was made of bone or stone, and later metal that was fixed to an arrow. Arrowheads may be attached to the shaft of the arrow with a cap, a socketed tang, or inserted into a split in the shaft and held by a process called hafting which meant fitting the arrow shaft to the arrowheads. The size and shape of the arrowheads were determined by the purpose of the weapon and the skill of the weapon maker. Larger points are regarded as spearheads, dart points, lance points or knife blades and are associated with Arrowheads and spear throwing Atlatl weapon. 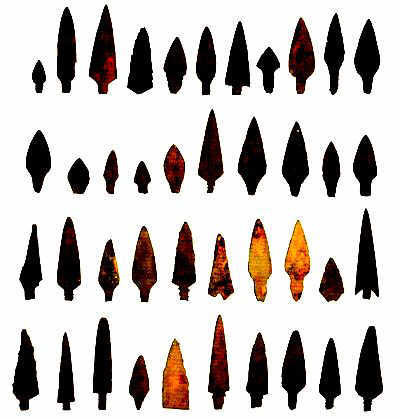 Larger points are regarded as spearheads, dart points, lance points or knife blades and are associated with Arrowheads and spear throwing atlatl weapon. Arrowheads were fixed to an arrow, were smaller than spear points and penetrated skin more deeply than when fired by a bow. The early arrowheads was made of a hard stone such as Flint that was sharpened into a projectile point by the process of Flintknapping. To make a projectile point, like an arrowhead, the piece of flint was directly struck with a hammerstone to remove large sharp flakes and break it into usable, thinner pieces of stone. The next step in making stone arrowheads is called pressure flaking. Pressure flaking was achieved by placing a pointed tool, such as an antler horn, on the edge of the stone, and applying an inward pressure to the tool to remove a small, thin flake from the stone. The objective of pressure flaking was to shape and refine the projectile point - the arrowhead. Notching was the final step in making arrowheads. The notches were made using a combination of pressure flaking and abrading (grinding) to carve out the gaps that allow the arrowhead to be bound to an arrow shaft.